Nov. 7, 2018, 11:01 a.m.
By Christine Schmidt @newsbyschmidt Nov. 7, 2018, 11:01 a.m.
As a younger-generation American who wants to be informed about my local area, is there a good option to get local news that doesn’t involve reading a site that feels like its pop-ups are draped with cobwebs? The media industry is still adjusting to serving those tricky millennials with the type of news and information that will get them informed to participate in democracy. (We’ll handle Generation Z, or whatever you want to call them, later, after their influencer Venmo deposits come through.) A Tufts poll drawing on 2,000-plus Americans between ages 18 and 24 recently found that of the 34 percent who are extremely likely to vote, 40 percent said local news had helped them prepare for the 2018 elections — though 40 percent said it wasn’t helpful. Overall, 31 percent of those polled said local news media has helped them warm up for voting, but demand is one thing and supply is another. 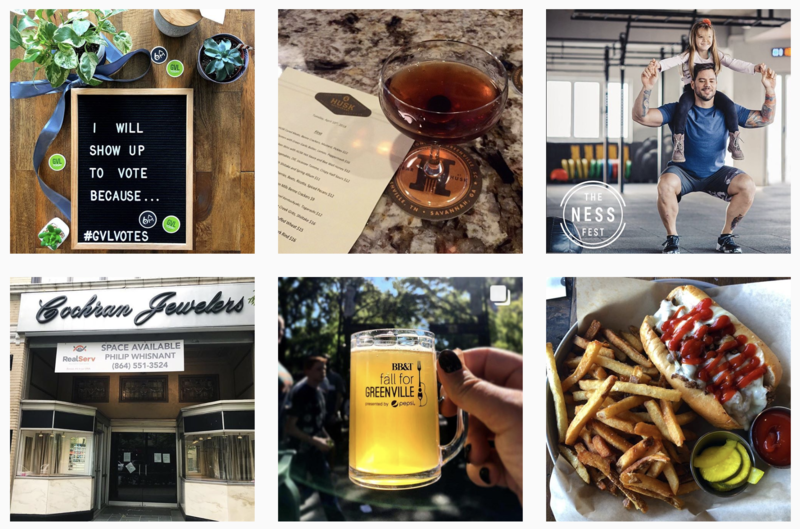 WhereBy.Us, based in Miami with branches in Orlando, Seattle, and Portland, encourages folks to “live like you live here” via peppy newsletters and social accounts curating other local reporting. It’s funded by advertising, events, and crowdinvesting, encouraging individual participation on top of traditional investors. Spirited Media, run by Jim Brady, launched brands in Philadelphia and Pittsburgh (though had to lay off nearly a third of its ten-person staff a year ago), merged with Denverite, and is now pushing a membership model. Denverite, Billy Penn, and The Incline do their own original reporting alongside lots of aggregation (including participating in collaborations with other local outlets). And the owner-operated Charlotte Agenda found profitability but laid off staff after launching a short-lived sister site in Raleigh. Add one more entrant to that local/young news space, this one popping up across the Southeast, from Lakeland, Florida to Asheville, North Carolina. 6AM is a network of six sites structured around daily newsletters and Instagram Stories of what are the cool kids in town up to, with a civic engagement flair. But instead of using venture funding or starting from scratch, 6AM is a spinoff of (gasp) a legacy print company: Community Journals Publishing Group, a small chain of business journals and magazines based in Greenville, South Carolina. “This was built out of the need for Community Journals to innovate but also for our passion to really make economic impact in our communities. A lot of times things are lost in the market because people just don’t know what they don’t know,” Ryan Heafy, 6AM’s director of operations, said. That, yes, of course, is a noble cause. Here’s another way 6AM frames it: “We like to say that our audience is local, vocal, and social. We try to position our brand as a community influencer,” said Ryan Johnston, 6AM’s managing director and former executive vice president of Community Journals. In each of its six local markets, 6AM has two multimedia producers (they take turns preparing the newsletter) and one engagement editor. The initial team launched the Greenville site, GVLtoday in July 2016 and expanded to Columbia in April 2017 to test its scalability. In February, Asheville and Charleston came onboard, followed by Lakeland in September. In late September, Chattanooga’s seven-year-old NOOGA.com became NOOGAtoday. 6AM plans to grow audiences in its existing markets for the rest of the year, though further expansion’s planned for 2019. Its total staff count currently sits at 24. “I think those communities where they are not big enough to have multiple daily papers, yet they are big enough to have a huge life force and a huge heart, they just want to be connected to their own community,” said Mary Willson, 6AM’s first editorial hire. Leading up to election day, we will be highlighting what you can expect to see on this year's ballot, providing details on how to register (this Wednesday, Oct. 17 is the deadline! ), and letting you know where you can hit the polls. // As making our voices + opinions heard is one of the greatest things about our democracy– we want to hear yours. Share your reasons for voting (plus your "I voted" sticker pics + all things related to the election) using the #CHSvotes or in the comments below. We will be selecting four lucky candidates to receive a gift card for participating in their civic duty. Heafy and Johnston said 6AM is profitable as a company, though individual markets are still shaking out as they launch and gain traction. The finances are reliant on ads and local business partnerships. (No, they’re not going to try subscriptions, probably never ever, they told me when I asked about memberships. Remember, those are two different things.) In total, 6AM has over 150,000 email subscribers and a 25 percent open rate; they’re on pace for more than 10 million email opens this year. And yes, the emails are sent out at 6 a.m. each weekday. The teams write one original piece a day, the Ryans and Willson told me — that’s the intro to the newsletter — but also curate a good amount of news reported by other local outlets in the “News Notes” section. 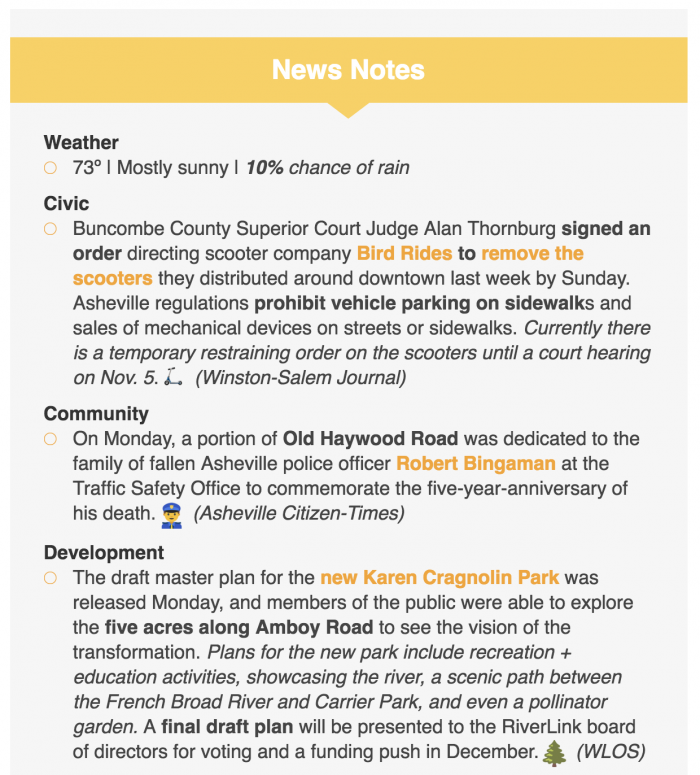 For example, the News Notes in Asheville’s newsletter from Halloween includes the weather; an item about a judge directing Bird to remove its scooters and a sentence about their current status, from the Winston-Salem Journal; a bit about a master plan for a redeveloped park, from local TV station WLOS; an update about an Asheville restaurant; and notice of an application for Habitat for Humanity assistance. I appreciated how each bullet point presented the information but then also clarified possible next steps (“A final draft plan will be presented to the RiverLink board of directors for voting and a funding push in December.” “Check out this week’s color report here.” “Here’s your election guide.”) And yes, almost every point has its own emoji, a motif familiar to Evergrey readers. Willson gets a lot of leeway to experiment. The Ryans gave her the green light to start a podcast, but she decided to table it after only two episodes — she was too occupied growing AVLtoday’s Instagram from zero to 10,000 followers over ten months. 6AM’s sites are active on Facebook, Twitter, and Reddit too, but the funnels often start with Instagram. “Sometimes it’s easier to eat your vegetables if you put it in a casserole, just like it’s easier to get people down into the newsletter about their city if they have seen it on Instagram as this entity that represents all of the city,” she said. To get the lay of the land in AVLtoday’s second month, Willson asked readers to send in their questions about Asheville. “As we enter our second month of publication, we want to plan our content around what ideas you have, and questions you want answered. Our goal is to help you be more engaged + entertained,” she wrote. 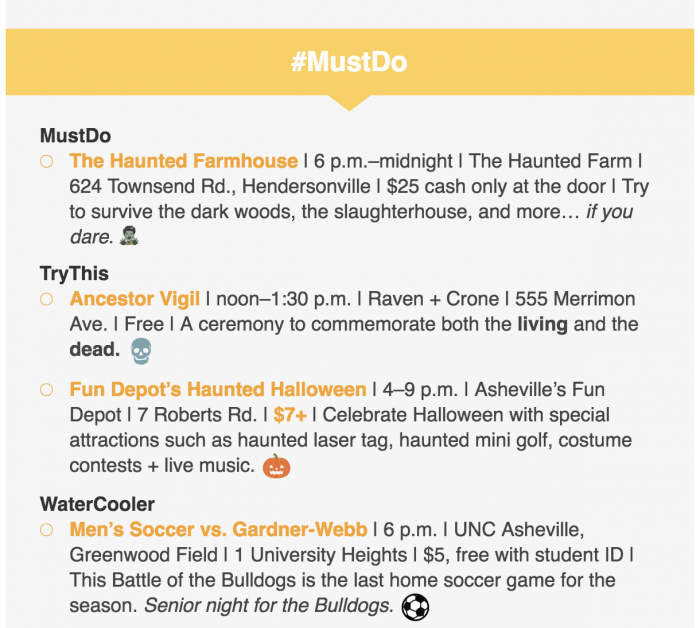 Then Willson organized the 100-plus responses into categories on the site — with topics like “local happy hours” to “How long do affordable [housing] units stay affordable?” to “Will the north side of Asheville ever get a movie theatre?”. The producers and editors follow up on a couple of responses each month and update the master list with the link when answered. The overwhelming sense I got from the Ryans and Willson was their focus on the POSITIVE VIBES of a community. The EXCITEMENT. The PRIDE IN PLACE. They want to help these sites — the geographic sites, not just their own websites — shine by getting the community amped up about it. When 6AM is considering a new market, they examine the revenue potential but “the bigger thing for us is focusing on pride in place. It’s a term we’ve coined and is a measure, in a lot of different ways, of how excited people get when a new business opens, when a new entrepreneur emerges in the community, when a new restaurant comes to town and they’re all amped up and excited, how much charitable giving per capita there is in in the market,” Heafy told me. “People wanted a clean way to experience their city and be excited about it and understand how they could participate,” Johnston said. They emphasized the need to keep 6AM newsletters feeling like a positive experience for both readers and advertisers. Not to be a Negative Nancy (I know, I’m such a millennial), but does that positivity provide the full picture of a place to 6AM readers? Top image from GVLtoday’s Instagram grid. POSTED Nov. 7, 2018, 11:01 a.m.
Schmidt, Christine. "Can this network of lit-to-be-local newsletters unlock younger civic engagement?." Nieman Journalism Lab. Nieman Foundation for Journalism at Harvard, 7 Nov. 2018. Web. 20 Apr. 2019. Schmidt, Christine. "Can this network of lit-to-be-local newsletters unlock younger civic engagement?." Nieman Journalism Lab. Last modified November 7, 2018. 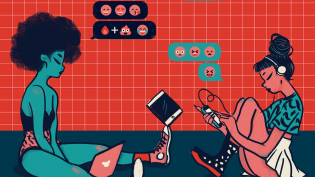 Accessed April 20, 2019. https://www.niemanlab.org/2018/11/can-this-network-of-lit-to-be-local-newsletters-unlock-younger-civic-engagement/. | title = Can this network of lit-to-be-local newsletters unlock younger civic engagement?